The Turbocat® is a powerful, air driven turbine powerhead that harnesses the airflow of a central vacuum system for deep, thorough cleaning. It’s lightweight and easy to maneuver, with a low-profile body and high impact bumper guards that make it perfect for cleaning under furniture. It requires no separate powercords, batteries or additional electricity. The Turbocat® is a powerful, air driven turbine powerhead that harnesses the airflow of a central vacuum system for deep, thorough cleaning. It's lightweight and easy to maneuver, with a low-profile body and high impact bumper guards that make it perfect for cleaning under furniture. It requires no separate powercords, batteries or additional electricity. 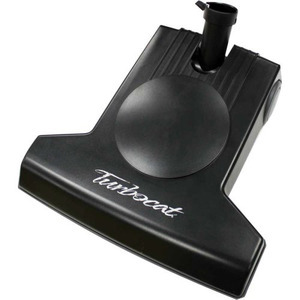 The Turbocat is a powerful air-driven powerhead that operates without electricity, power cords or batteries. This powerhead harnesses the airflow of the central vacuum system to generate maximum airflow and deep cleaning power. Installation and operation are easier and less costly. The DeepSweep Agitator was created to efficiently bring embedded dirt to the surface, so it can easily be vacuumed away. The staggered bristle design allows constant contact of bristle to carpet. The crimped bristles effectively separate carpet fibers allowing airflow to pickup and remove deep, embedded dirt. Since the Turbocat needs airflow to operate it works as a gauge of your central vacuum system performance. If the system airflow is restricted, the Turbocat will slow down, letting the user know the central vacuum is not operating at optimum performance levels. This drop in airflow could be attributed to clogged bags, filters or a tube line clog. Electric powerheads will not gauge restricted airflow in the system. The motor will keep rotating the brush roller even though there is little dirt being vacuumed because of a clogged dirt bag or filter.